When I think of photography in Seattle or Portland or even the general Pacific Northwest, I think of moss covered trees, giant ferns, and lavender fields. I'm a forest girl. I don't care about the beach or the city, give me squashy moss and trees and my heart is happy. Even though I'm actually allergic to lavender, I will always try to find time to do photography sessions in the lavender farms there. You can smell the lavender all the way down the road. In fact, lavender is all of the entire city! On corners, at the airport, in people's backyards.. everywhere. It's a staple of the Seattle area! When I'm planning a photo session on a lavender farm, I want something that doesn't compete with the flowers. White or grey or lavender dresses are best, and simple hairstyles without crowns are my favorite. For this photo, I chose dresses from Tutu Du Monde, an Australian designer dress brand with a clean but vintage look. 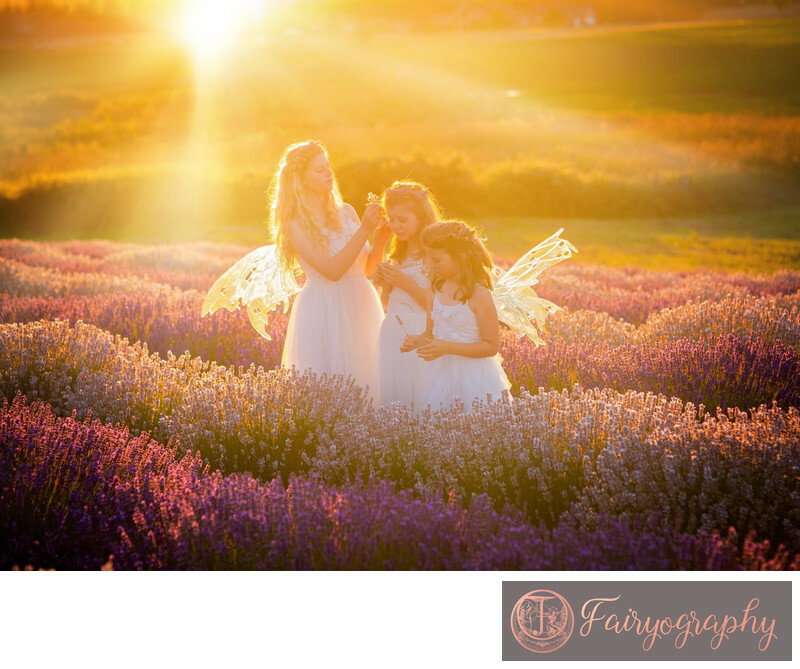 These three sisters looked amazing in the white milk color, and the translucent fairy wings caught the light perfectly. The girls have lavender braided into their hair instead of wearing crowns to complete the simple elegant look. Location: Purple Haze Lavender Farms 180 Bell Bottom Rd, Sequim, WA 98382. Keywords: Siblings (147). 1/250; f/3.2; ISO 320; 85.0 mm.